Nominé aux Grammy Awards 2013 avec le groupe Heritage Blues Orchestra, désigné meilleur harmoniciste français à deux reprises (Trophées France Blues). Le talent de Vincent Bucher , reconnu internationalement, l’a mené à collaborer aux Etats-Unis avec de grandes figures du blues : Louisiana Red, Eddie C. Campbell, Jimmy Johnson, Lurrie Bell, John Primer, Billy Branch, etc. qui font appel à lui pour ses qualités de musicien, mais également de producteur-arrangeur. Ouvert à d’autres horizons musicaux, Vincent Bucher a tourné, enregistré, avec des artistes aussi divers que CharlElie Couture, Paul Personne, Bill Deraime, Boubacar Traoré, Tao Ravao. Ces collaborations l’ont mené sur les grandes scènes et festivals du monde entier. 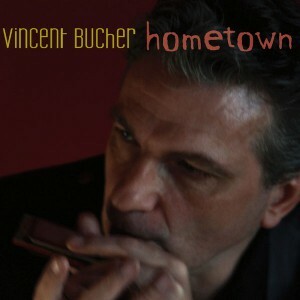 Aujourd’hui Vincent Bucher présente son premier album solo, Hometown, reflet de la richesse de son parcours musical. Passionate about the Blues ,Vincent started playing harmonica at the age of sixteen . His professional debuts took place in the streets and subways of Paris –France where he was soon noticed by the master African American harmonica player Sugar Blue who started tutoring him and was the first to call him on stage . It didn’t take him long to integrate the French club and concerts circuit which gave him the opportunity to play with many American Blues legends such as Louisiana Red , Sonny Rhodes , Jimmy Johnson , Eddie.C .Campbell , Eddie Shaw etc.. touring in France . Vincent became quicly approached by various famous French artists ( Bill Deraime , Paul Personne , Charlelie Couture , Etienne Daho etc … )for shows and recording sessions . Along with his long time partner Tao Ravao from Madagascar ( with who he recorded six albums ) , with the legendary Malian singer and guitar player Boubacar Traoré Vincent has been touring in Europe ,in America but also in Africa where , working in shows , recordings , projects with local artists , he ‘s been exploring the links between Blues and different styles of African music . Vincent is part of the Heritage Blues Orchestra and has been nominated , as a band member, for the 2013 Grammy Awards with the album “ Still I rise “ . Meanwhile for the last twenty five years Vincent has never stop fronting his own band , playing his material : original songs reflecting his love for the Blues along with all the different influences his experiences brought him .